Nicky Jenner presents Mars as the planetary neighbor that has most deeply captured the imagination of scientific and artistic communities throughout the eras. 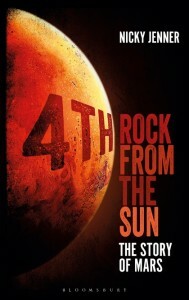 Unfortunately, her book 4th Rock from the Sun: The Story of Mars fails to make a compelling case for this claim. With its slipshod structure and harrowingly large showcase of disproven pseudoscience, Jenner never pieces together the memorable “story” promised in the title. Since this book’s more interesting moments aren’t Mars-specific and instead pertain to space exploration in general, interested readers would be wise to select a different book within this field of scientific inquiry. 4th Rock from the Sun quickly reveals its structure, which resembles a laundry list. An early phase of the book documents at significant length all the ways Mars has been interpreted and portrayed throughout the history of civilization. Readers must plow through a comprehensive tally of Mars-inspired books, movies, songs—including Veronica Mars, which the author notes is a merely superficial nod with no deeper meaning. (Then why should we care?) With so little tying these references together, you would be more effectively served by the “In Culture” section of this planet’s Wikipedia page. It’s perplexing that this tedious account of depictions in media would get such extended treatment prior to a majority of the scientific analysis contained in this book. More troubling is the vast amount of pseudoscience explored at length throughout. Mars has a significant presence in mythology, astrology, palm reading, and tarot card canon, but to say this hogwash is minimally interesting would be generous. Jenner intermittently recounts various Mars conspiracy theories, including the previously-suspected system of canals carved by well-hidden Martian lifeforms, as well as the formation of images perceived in the planet’s geographical surface features. Regarding the latter, we are treated to a list of no less than thirty examples, including Ted Kennedy, a wrench, a gopher and Kermit the Frog. That some of these perceptions are claimed by blogs like “UFO Sightings Daily” and other conspiracy theory factories only highlights the absurdity. To be sure, Jenner fully acknowledges the falsity of these claims. But ultimately, she devotes a significant portion of this book’s real estate to ponder this foolishness, so she’s not absolved. It would be a bit more acceptable had this content been quarantined to a specific chapter, but it’s increasingly irksome that the entire book is peppered with it. With these choices of content in mind, it’s fitting that the book’s style and structure feels amateurish, especially since Jenner’s resume prior to this (her first book) is limited to science articles. Early on, Jenner explains how the sandstorm in the opening scene of The Martian is exaggerated for the purposes of dramatic artistic license, but seventy pages later she refers to the same film as an example of factually correct science fiction. In addition, the intertextual quotations often feel flimsy—there’s something undeniably tacky about citing multiple webcomics, podcasts and Reddit AMAs in a work of scientific nonfiction. It doesn’t help that of all the book’s footnotes, greater than half are skippable banalities. There are other ways Jenner intermittently undermines reader confidence in her presentation: Is it necessary to describe Roger Ebert as “a renowned film critic?” Is it sensible to use the word leonine if it’s immediately followed by the word lion in parentheses? 4th Rock from the Sun is certainly not without its interesting moments, but oddly, they are largely found at the beginning and end. The introduction features an overview of Mars’ geographical features—enormous dust storms, highly variable temperatures depending on elevation, polar icecaps, and the challenges of its low surface gravity. It sets the stage for an interesting story, but this stage never feels fully utilized. In the obligatory “Looking Forward” phase that concludes the book, Jenner highlights many of the interesting challenges that future astronauts will face when traveling to Mars: microgravity’s negative effects on muscles and bones, impaired vision, balance and appetite, and the largely untested gradual effects on social and mental health. But there’s a catch: though these tidbits are no doubt interesting, they apply to any realm of human space travel, and don’t add up to a compelling Mars-specific saga. What makes up the rest of the book? Chapters on the planet’s origin theories, its orbit, its moons, and the many robots that have roamed its surface. Unfortunately, none of these sections contain many memorable moments, and many are tediously structured like the aforementioned laundry lists of pop-culture manifestations. Was this book was greenlit in the wake of The Martian film’s wild financial success? Regardless, the resulting book does not contain enough engaging narratives to justify its existence. With its tedious chronicles of disproven hypotheses and weakly structured presentation of ideas, 4th Rock from the Sun is largely forgettable. Readers would be better served by the works of Brian Greene or Richard Dawkins—for that matter, you could also just check if the film Interstellar is available on demand.